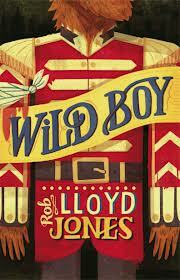 I had so much fun reading Wild Boy by Rob Lloyd Jones. I started reading this book and it immediately felt like my heart had been stolen by Wild Boy. He's such a wonderful character and my heart really went out to him. There is so much to love about this book. Wild Boy as a character wormed his way into my heart very early on in the book, with the way he's always been poorly treated and how all he's ever wanted is for a friend, somebody who doesn't rear back in revulsion at the sight of him. Unfortunately for Wild Boy, he was first abandoned at a work home and then later taken in by the showman of a travelling circus, to be the star attraction in the freak show. It is at the circus when him and his arch-enemy, Clarissa stumble upon a mysterious letter warning of bad things to come that Wild Boy gets into the middle of some pretty dangerous things and sets off to solve this mystery that is unfolding around him and to clear his and Clarissa's names. I especially loved the mystery that comes with Wild Boy - of the Gentlemen, this powerful machine that is worthy murdering for and also finding out how and why Wild Boy or this circus came to be involved. There were plenty of times where Wild Boy is deciphering clues around him at a crime scene that made him really reminiscent of a young Sherlock Holmes with his powers of deduction. It made me love Wild Boy that much more. With Wild Boy's cleverness and Clarissa's physical ability as an acrobat, they make an amazing crime-solving team. And I wanted to cheer for the pair of them. throughout. Plus, this book is set in Victorian London and trying to solve these murders and to catch up with this hooded figure takes Wild Boy and Clarissa all through London to some pretty creepy places. Sewers and graveyards and a rather grim anatomy college surrounded by bones and body parts. But everything about it was fascinating and I loved how vividly I was able to see what it might have been like in London in 1841. Wild Boy is a wonderful book, filled with adventure and mystery and with really great characters. I highly recommend that you read it! This sounds so great - what a brilliant combination: freak show, Victoriana, mystery! It IS a brilliant combination! It is! Sounds fantastic and what a great cover! Oh I completely forgot to mention the cover in my review, I think it's amazing! I have this on my TBR and cant wait to read it, thanks for sharing your thoughts, Wild Boy sounds so good! I never really thought of the lack of historical detail in TID, but you're so right, it isn't there! This does though!